• 1 clove garlic diced. (I use the pre diced garlic in a jar. Use 1 tablespoon). Bake pie crust as directed on box, cool. Cook both bags of vegetables in microwave as directed on container. Make 6 servings of instant mashed potatoes as directed on container. Brown ground beef, drain. On medium/high heat, add ground beef and onion to pan. Cook stirring occasionally until onions are translucent. Add garlic, veggies, beef broth, salt and pepper. Cook for five minutes stirring until broth is absorbed. Fill pie crust with beef and veggie mixture*. Spread a layer of mashed potatoes on top. Spray with a little Pam or spray butter. Put in a 350 degree oven for 5-8 minutes. *you may have leftover mixture and mashed potatoes. 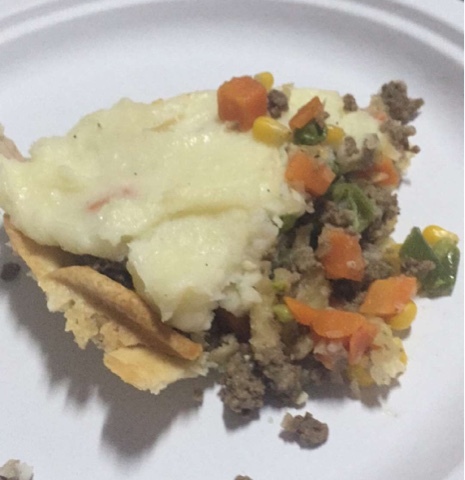 You can either make 2 pie crusts and fill or put the mixture in a dish and add the rest of the mashed potatoes on top for a crust less shepherds pie.